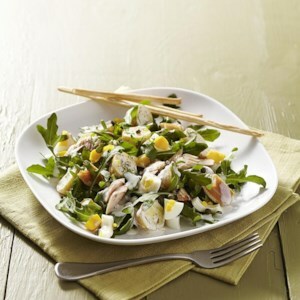 Find healthy, delicious low-calorie potato salad recipes, from the food and nutrition experts at EatingWell. 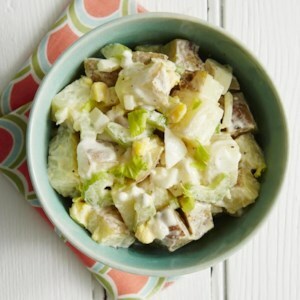 This low-carb potato salad recipe, ideal for potlucks, is perfect for diabetic meal plans. With just 3 grams of fat, this summer classic makes a great addition to burgers, chicken, and other grilled favorites. 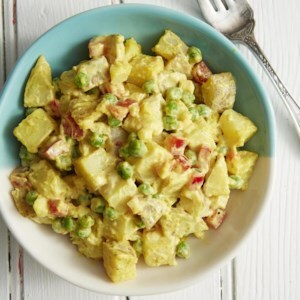 A dressing of nonfat yogurt enriched with a little reduced-fat mayonnaise and Dijon mustard replaces the heavier dressings in more traditional potato salad recipes. 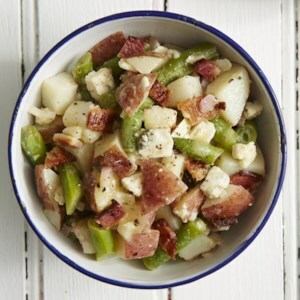 This updated picnic potato salad gets subtle flavor from smoked ham. If you can find them, small, thin-skinned early potatoes are best in this salad. Tossing potatoes with a little good vinegar while they are still warm infuses them with flavor. Capers, gherkins and a touch of anchovy give this old-fashioned salad a piquant finish, while red bell pepper and celery give it an appealing crunch. In this sophisticated dinner salad recipe, tender, new potatoes and early summer arugula add a dynamic duo of creamy and peppery texture and flavor to the smokiness of the trout. You can hard-boil the eggs ahead of time, but in a pinch, just add them into the pot with the cooking potatoes. They're just as tasty served warm in this salad. 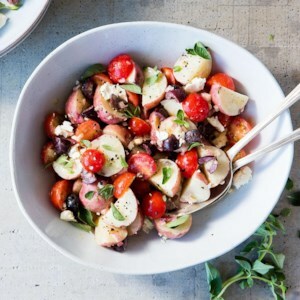 In this healthy potato salad recipe, a white-wine vinaigrette dresses the potatoes, tomatoes, feta and olives. 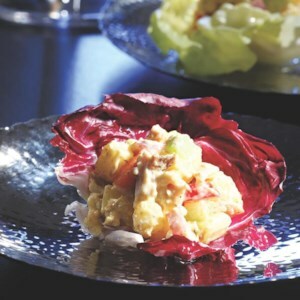 Waxy potatoes, such as red and yellow, make the best potato salad because they hold their shape when cooked. Keep the potato skins on for more fiber and potassium. 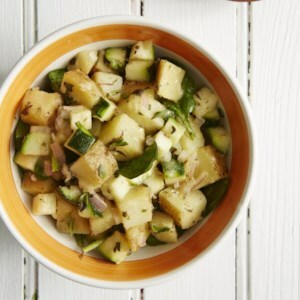 In this healthy potato salad recipe, a cumin-spiked vinaigrette coats the potatoes, zucchini and baby spinach. 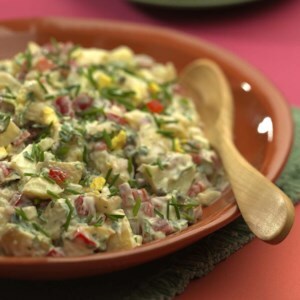 Waxy potatoes, such as red and yellow, make the best potato salad because they hold their shape when cooked. Keep the potato skins on for more fiber and potassium. In this healthy and creamy potato salad recipe, yogurt replaces half of the mayo and we keep the potato skins on for more fiber and potassium. 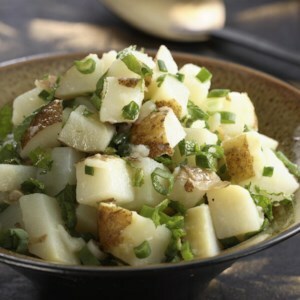 The herbs give this potato salad a fresh and bright flavor. Feel free to experiment with your favorites. In this healthy and creamy potato salad recipe, yogurt replaces half of the mayo and we keep the potato skins on for more fiber and potassium. 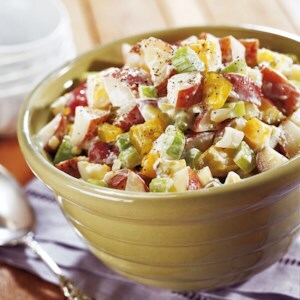 Red bell pepper and green peas add even more color to the yellow-tinted potato salad. In this healthy and creamy potato salad recipe, yogurt replaces half of the mayo and we keep the potato skins on for more fiber and potassium. To hard-boil the eggs while your potatoes are steaming, place them directly on top of the potatoes in the steamer basket. They'll be perfectly hard-boiled when the potatoes are tender. In this healthy dinner salad recipe, tender new potatoes and baby arugula add a creamy texture and peppery flavor to the smokiness of the trout. You can hard-boil the eggs ahead of time, but if you cook them while you steam your potatoes, they'll still be a little warm when you serve the salad, which makes it extra special. 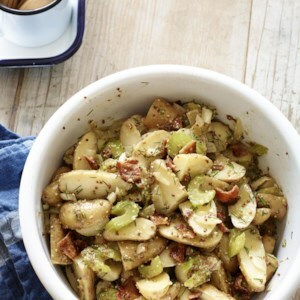 This updated take on German potato salad is a sophisticated addition to any holiday spread. 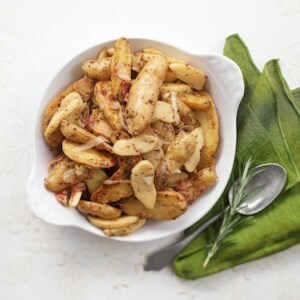 Granny Smith apples are a good choice, as they hold their shape when roasted. With a store-bought or leftover roasted chicken, this hearty curried chicken salad is ready in a snap. 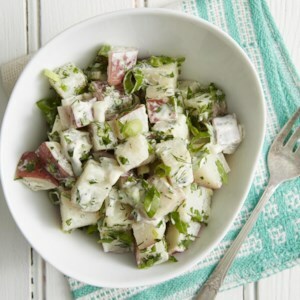 ?Dressed with a tangy lemon vinaigrette and fresh mint, this invigorating--and dairy-free--potato salad makes the perfect summer potluck contribution. 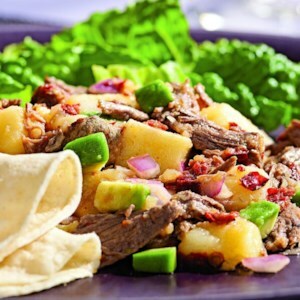 This hearty steak and potato salad is inspired by salpicón, a favorite dish in Chile. The purple potatoes add vibrant color but you can substitute any young “new” potatoes that are harvested early in the season--even small fingerlings would work. 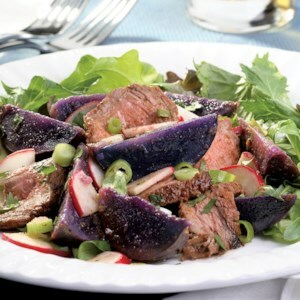 Serve on a bed of spicy mesclun greens to round out the meal. This recipe can easily be doubled. 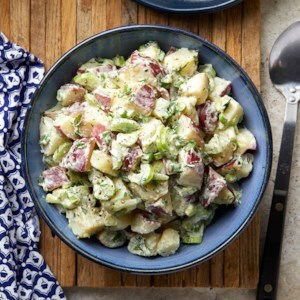 Our take on this potato salad has a light creamy dressing made with nonfat yogurt and low-fat mayonnaise and gets a unique hit of richness and flavor with the addition of pureed roasted garlic. 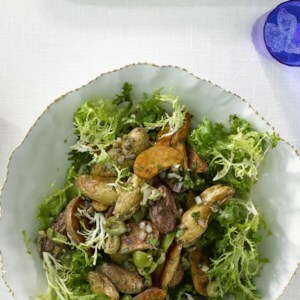 Add roast potatoes to your greens in this healthy salad recipe. Frisée holds up well to the warm olive-and-caper dressing, but any sturdy green, such as curly endive or escarole, works too.